This was a great episode of Mawaru Penguin Drum, both for throwing yet more crazy stuff at us, and for revealing some of what had been hidden. We now have some interesting answers, and, of course, a bunch of new questions. Kanba ponders the spent penguin shell. Yui and Chizuru have their memories wiped by the penguin shells. This scene was very effective. We (along with Kanba) got some idea of the power of the heretofore previously unknown penguin shells. 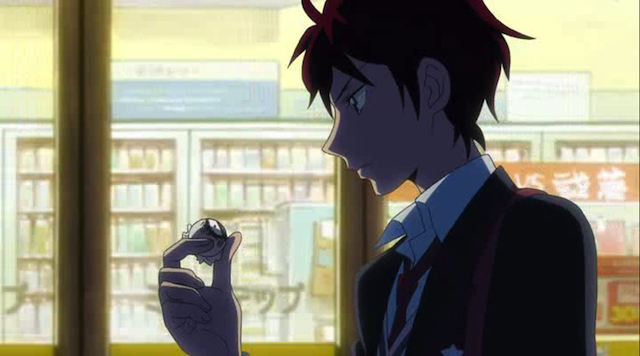 “Penguin shell” is what I’m calling the balls that Natsume shoots. Now Kanba doesn’t know that Natsume is the shooter, but he does know that someone has a ranged attack that can wipe a person’s memory. The way that Kanba was maneuvered into discovering this was creepy in itself, because it indicates that Natsume (again, Kanba only knows it is someone who knows he is searching for the penguin drum) is less interested in the attack on the girls, and more interested in demonstrating to Kanba that she can attack people around him. 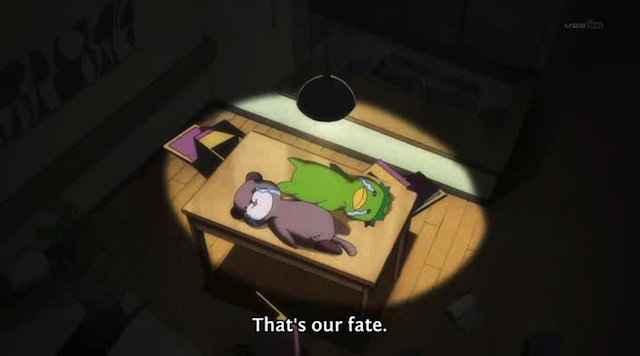 I wonder if this is a threat to do the same to Kanba’s siblings. 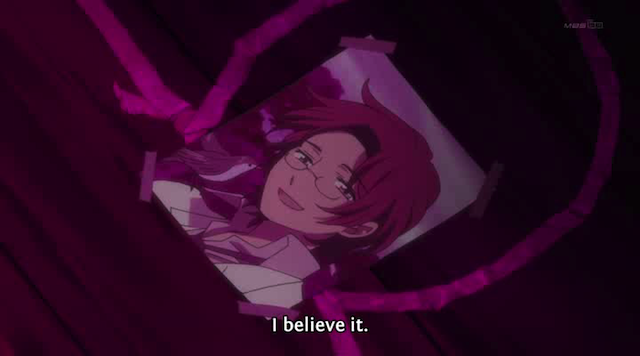 Exactly what Natsume’s motivation may be is still very unclear. Creepy and surreal. Ringo is one messed up chick. Even her memories are disturbing. Ringo in full-on creeper mode. She spends the night with Tabuki. Wow. 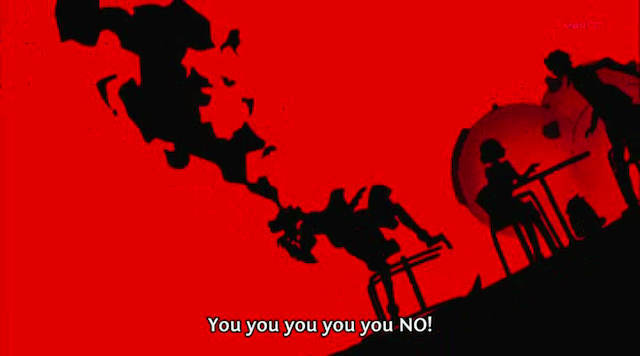 This episode had a lot in it, but Ringo’s incredible delusions were just … wow. First we get confirmation about something that has been unclear. Ringo has NOT been writing in the “Fate Diary”. These are not her own wishes at all. The diary was written by her dead sister, Momoka, and Ringo is living out Momoka’s fantasies in the hope that she can bring Momoka back for her family, and thus heal her parent’s dysfunctional relationship. This is delusional on an extraordinary level. Second, given that we now know Ringo isn’t stalking Tabuki out of her own desire for him, but rather as a way of fulfilling her dead sister’s desire for him, and her own desire it to get her parents back together, the suspicion is raised in my mind that Ringo has no real idea what adult love is. When she thinks of spending her first night with him, she doesn’t really think in terms of physical intimacy, but rather believes that she can fulfill the prophecy of the “Fate Diary” by sleeping in the crawl space underneath his house. Once again Ringo’s stretched (it is tempting to say “deranged”) interpretations of the prophecy makes me question whether the Diary really has any power at all. On the other hand, there was some hint that she did, in fact, fulfill the letter of the prophecy, but through her interactions with Shouma, not Tabuki. Something that has been bugging me for a while is a scene in the OP in which the three penguins clearly are accompanied by a fourth. Who is this mysterious fourth penguin? Well we don’t know that, but now we do know that it is associated with Masako Natsume, who also has the weapon that shoots “penguin shells”, and is the one who is tormenting Kanba, and who seemingly knows he is searching for the Penguin Drum. 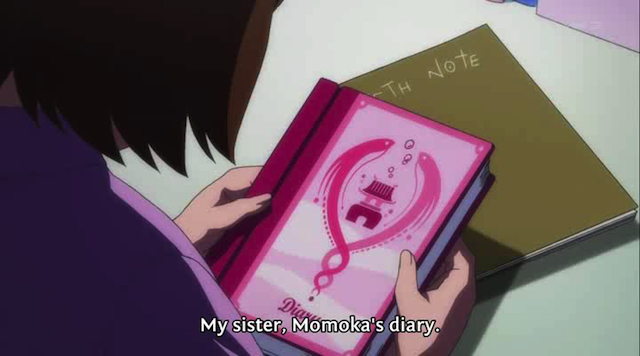 Now this raises a few questions: Is Ringo’s Momoko’s diary really the Penguin Drum? 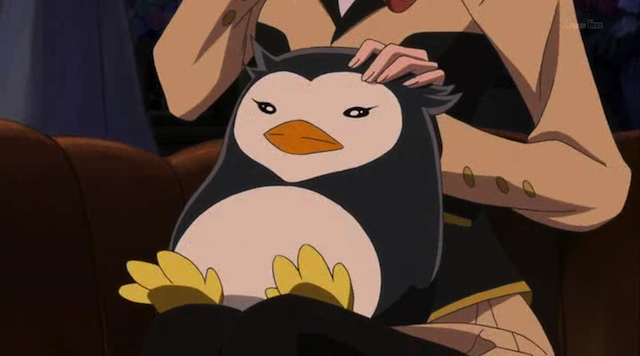 Perhaps Natsume is the one truly in possession of the Penguin Drum? Maybe there is a second diary, or maybe the Penguin Drum is really the weapon that shoots “penguin shells”? Or perhaps Natsume is also looking for the Penguin Drum, and hopes that she can get it by following or manipulating Kanba? Also, are the penguins with the Takakura siblings associated with Natsume’s penguin? Perhaps the forces behind both sets of penguins are opposed to each other (this explains, perhaps, why there is a need for a “survival strategy”)? To sum it up: a very interesting episode. The mystery deepens once again. More good times are ahead, I can feel it! Note: For a completely different (and fascinating) approach to this episode, please check out the joint post by ajthefourth & vucubcaquix on Altair and Vega. I don’t think this is the case at all. 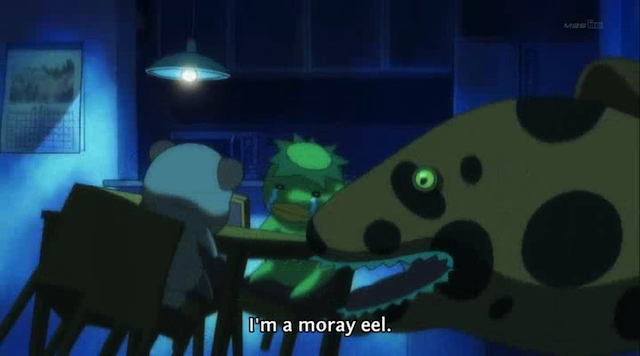 Momoka was 6 at most when she died. She could not have written the diary. I still think Ringo wrote it after someone had given it to her, cue the Deth Note reference. That’s an interesting thought. I’m not sure how you can assume she was at most 6, though. I haven’t seen anything to indicate that Momoka was any less than 16.